Figure 1. The ancient choir hall in Carlisle Cathedral, UK. 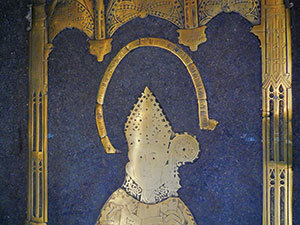 The blue rug in the center aisle covers the fascinating decorations on Bishop Bell’s tomb. Image credit: David Iliff. License: CC-BY-SA 3.0. Used in accordance with federal copyright (fair use doctrine) law. Usage by ICR does not imply endorsement of copyright holders. A few years ago I visited Carlisle Cathedral, a very old church in northern England. I’d seen pictures of medieval carvings from this church that looked like dinosaurs.1 How could this be, unless the artists somehow saw the dinosaurs they carved? Maybe they weren’t dinosaurs after all. I thought a closer look might help me decide. My wife, Michele, joined me. She persuaded the kind rector to remove the rug that covers the tomb of Bishop Richard Bell, located in the middle of the church floor (Figures 1 and 2). Brass decorations on the tomb include the dinosaur look-alike carvings. Even though we said nothing about our specific interest, the rector mentioned that despite what he had heard from others, there were no dinosaurs pictured at his church. Figure 2. Upper portion of Bishop Bell’s tomb. The banner over his head quotes Job 19:25 in Latin. A nearby wall plaque identified 1478 as the year Richard Bell became Bishop of Carlisle. Bell died in 1496, when Martin Luther was 13 years old. Who knows what animals may have lived in Europe back then that have since gone extinct?. 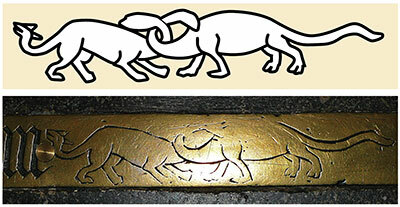 Within Bishop Bell’s tomb decorations, we saw true-to-form carvings of normal animals like an eel, a dog, a fish, and a bird (Figure 3). Others were trickier to identify, but none of them looked childish or fanciful. I took a closer look at the two dinosaur look-alikes. The palm of my hand could cover the whole design. It shows two long-tailed creatures with legs that go straight down like dinosaurs’ legs did, rather than angling to the side like those of modern crocodiles. Their long necks intertwine in a reptilian wrestling match. If I were trying to etch two sauropod dinosaurs in brass, I would carve something just like this (Figure 4). Figure 4. Bell's sauropod look-alikes. Image credit: Dave and Joliet Lee. Figure 3. Bird carving on Bishop Bell's tomb. The images look like high-hipped sauropods, as opposed to high-shouldered ones.2 Centuries of foot traffic have worn down the head and neck regions, but the sauropod on the left has a tail tip with a knob that bears spikes. 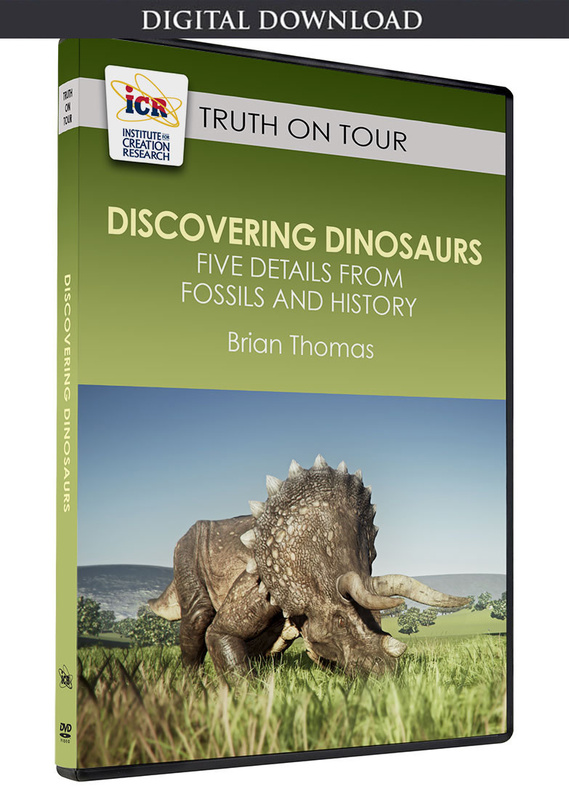 Fossil experts didn’t discover sauropod tail clubs until about 1989, from a Shunosaurus fossil found in China.3 A report in 2009 revealed another rare sauropod named Spinophorosaurus with a spiked tail club, this time from the Republic of Niger in Africa.4 Both fossils had spikes in two sets of two. The Bishop Bell sauropod also shows four tail spikes. How could a 15th-century artist have known about such details as straight legs, long necks, and spiked tails? What best explains this fascinating carving? Could it be a modern forgery? That’s not realistic. Nobody has found evidence of forgery. The sauropods are integrated into the whole work of art, they reveal the wear and tear expected from centuries of foot traffic, and the grave marker has been known and described for centuries.5 Did the ancient artist carve imaginary creatures that just happen to look like sauropods? The list of matching body parts makes this equally unlikely. What animal other than a Spinophorosaurus-type had all these features? Figure 5. The two paired tail spikes of Spinophorosaurus nigerensis. Image credit: Remes et al, 2009, PLOS ONE.4 Adapted for use in accordance with federal copyright (fair use doctrine) law. Usage by ICR does not imply endorsement of copyright holders. If Bishop Bell’s artist saw live sauropods—or at least saw drawings or heard descriptions of them—then no wonder he or she carved images that look like sauropods. But that would mean dinosaurs lived in or near medieval England. If so, where did they come from, and where did they go? Using the Bible as a history guide, we can start with the Job 40 behemoth, which Job was commanded to “look now at.” God told Job this creature was “the first of the ways of God” (v. 19). The behemoth was undisturbed though “the river may rage” (v. 23). In other words, it was huge. Its prominent hips and “tail like a cedar” (v. 17) fit a sauropod—the largest land animals that God “made along with you” (v. 15) on Day 6 of the creation week. Dinosaurs lived in the area after the Flood but went away after drastic climate change erased their swamps. Job 40 describes behemoth’s lush swamp, and verse 23 names the Jordan River. Scripture tells of many droughts that caused famines after that time, leading to arid conditions in today’s Jordan and across the Middle East. So, dinosaurs lived in the area after the Flood but went away after drastic climate change erased their swamps. A similar scene could have happened in Europe. 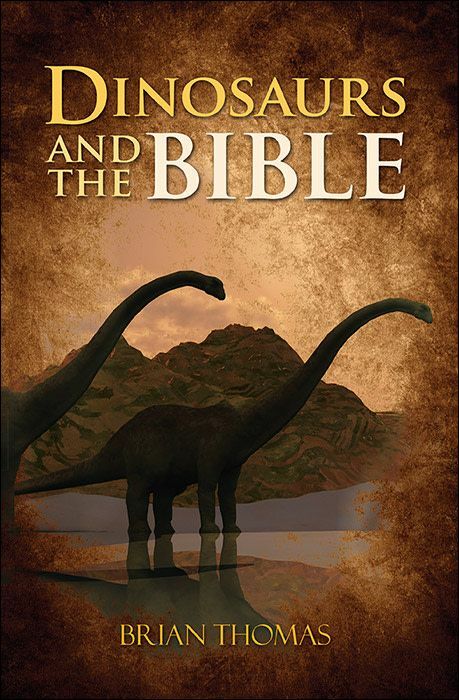 The first post-Flood dinosaurs came from Noah’s Ark, which landed in the Middle East. From there, descendants found new swamps. They could have walked on land that connected France to England during the Ice Age, when the sea level was lower. A giant ice dam soon broke and released an enormous lake that carved the English Channel and helped raise the sea level.7 Living dinosaurs are unknown today, so where did they go? Europe’s inhabitants drained its many swamps long ago. Dinosaurs dwindled when their wet homes dried, and others might have been killed because people saw them as a threat. After sifting the evidence, I decided to disagree with the rector at Carlisle Cathedral. I cannot deny the clear dinosaur decor on Bishop Bell’s tomb. Not just any old dinosaur, but one like a Shunosaurus, alive and beheld by humans just like Job’s behemoth. Bell, P. 2003. Bishop Bell’s brass behemoths! Creation. 25 (4): 40-44. Brachiosaurids had tall shoulders, whereas diplodocids and others had tall hips. Dong, Z., G. Peng, and D. Huang. 1989. The Discovery of the Bony Tail Club of Sauropods. Vertebrata PalAsiatica. 27 (3): 219-224. Remes, K. et al. 2009. A New Basal Sauropod Dinosaur from the Middle Jurassic of Niger and the Early Evolution of Sauropoda. PLOS ONE. 4 (9): e6924. For example, Bishop Bell’s brass was described long ago in Eley, C. K. 1900. 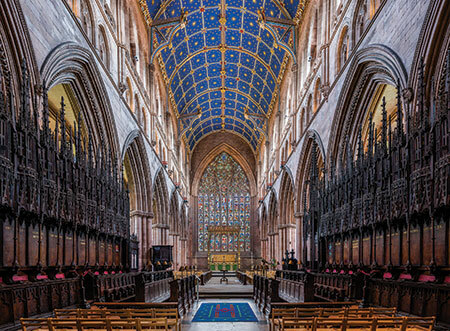 The Cathedral Church of Carlisle. Edinburgh, UK: Riverside Press, 53. Nelson, V. 2011. Dire Dragons, 3rd ed. Red Deer, AB: Untold Secrets of Planet Earth Publishing Co., 74. Gupta, S. et al. 2007. Catastrophic flooding origin of shelf valley systems in the English Channel. Nature. 448 (7151): 342-345. Cite this article: Brian Thomas, Ph.D. 2018. Did Medieval Artists See Real Dinosaurs?. Acts & Facts. 47 (7).